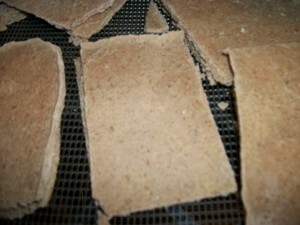 Hi Guys, Today I’m here with another recipe, today we’re making Raw Oat Bread. Depending on your belief of oats it could be considered gluten-free, and depending on which ingredients you use, it can easily be vegan. One thing I can tell you is that its raw, budget friendly, and super tasty! This is also really simple, and compared to normal bread it’s extremely quick! Take your oat groats, almonds, sea salt, sweetener, sesame (or other seed/nut), and psyllium hus, into your food processor. Process for about 1 minute, or until it starts to mush up. If your mixture needs more moisture, add in your nut milk(or water) while the food processor is running. I ended up using about 1/4 cup of almond milk, however this will vary for everyone. Keep processing until it turns into almond pudding, and will hold onto a spoon for several seconds one tipped over (see video). Spread out on your dehydrator’s nonstick sheets, I went with about 1/4 inch thick, but if you want really thick bread, I would go with 1/2 inch. You can use a spoon but I find using your hands with some coconut oil or olive oil on it really works best. Try to make the “dough” as even as possible to assist with drying. I got 2 full trays out of my mixture. Dehydrate @ 105 degrees for 12-18 hours. After about 2-3 hours you’ll want to flip your bread sheet over to dry evenly. My bread was done after 14 hours (when I woke up the next day). It was about half the original thickness, and still semi soft but you can tell its dry. I would still probably store them in the fridge if you’re wanting to save them longer than a few days. Cut them with a semi sharp knife into equal “sandwich” sized pieces. I ended up with 12 pieces, but accidently broke two of them. I can’t wait to make a nice raw sandwich tomorrow! If you wanted to, you could add cinnamon, extra sweetener, raisins, maybe some nutmeg and make this into a great cinnamon raisin bread. I will eventually demo this aswell. I’m an enormous supporter of this web site, keep up the nice work.